Ontologies build the central prerequisite for Corporate Semantic Search and Corporate Semantic Collaboration scenarios. Thus, in Corporate Ontology Engineering we research methodologies and tools for detecting and collecting expertise and for the administration and use of the resulting ontology models. Current approaches to these topics cover ontology development, storage, maintenance and evaluation. Accepted ontology languages are provided by the World Wide Web Consortium (W3C) as RDF(S) and OWL which feature a XML-conform and Web-compatible fundament for networked, exchanged and reused ontologies in distributed environments. These technological foundations do not tackle the problems of ontology design, implementation and maintenance in corporate settings in a holistic manner. Context-sensitive facts and process-dependent aspects have to be modelled. Furthermore, the economic and collaborative dimensions of the process side are insufficiently researched, which play a major role in business contexts. Creation and maintenance of ontologies are cumbersome and time-consuming tasks. Therefore, cost-effective methodologies and tools are essential for adopting ontologies in corporate settings. Modularization and Integration of ontologies allow to decrease the capital expenditure by enabling reusing relevant parts of already existing ontologies. The operational expenditure is also kept at a low level through an adequate partitioning of the corporate ontology. Modules of a suitable size are easier to maintain and allow more efficient usage. It is investigated how ontologies can be modularized and integrated in corporate settings and which information available in business environments are relevant. The World Wide Web is large-scale, unregulated and heterogenous. Every individual is free in publishing, adapting and (re-)using information. These characteristics of the Web raise new problems with respect to ontology usage as ontologies can independently evolve, making it hard to keep user-generated data based on an evolving ontology consistent or to control the separate evolutions of the same ontology. 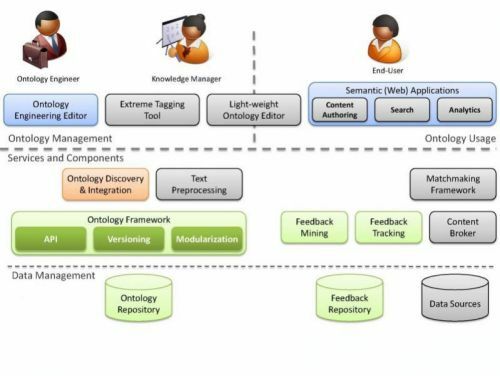 We research a life-cycle management for ontologies which suits corporate settings with emphasize on control of user-specific and process-specific versions of ontologies including consistence checking, rollout and rollback of changes, individual adoption by users (automatic and on-demand) and matching of ontology versions. Our working group will focus on economic apects of ontology engineering processes as part of agile software engineering scenarios. Small and mid-sized companies seek lightweight and dynamic methods and practices for ontology development and maintenance. Based on this insight, we adopt agile principles and practices from the software engineering domain to the process of ontology development. Nonetheless, economic aspects of ontology development are just as important as the technical aspects involved. We tackle the problem of foreseeing the economic risk of ontology development endeveours by proposing a cost estimation model, considering cost drivers specific to the ontology engineering process, and adapted to the dynamic management structures of agile ontology development. 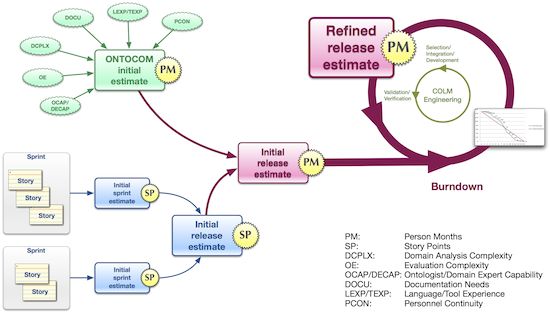 The latest outcome of our research is an adaptable hybrid cost estimation model, based on algorithmic cost models borrowed from the software engineering domain, and adapted to the SCRUM practice, which involves short development cycles as well as frequent project reviews. By feeding project critical factors gained from the project reviews back to the cost predicition model, we obtain a more accurate and dynamic insight into the project and the actual factors influencing a project's progress. The corporate context poses new challenges for ontology evaluation which is the process of measuring the quality of an ontology. While evaluating an artifact requires intuitively an in-depth analysis with keeping the application environment in view, the corporate context requires cost-sensitive and efficient processes. In Corporate Ontology Engineering the process of ontology evaluation is tackled in such a way that the influence on the existing and running enterprise systems and business processes should be as low as possible. Previously, we worked on the processes of ontology versioning, modularization and integration and argued that reusing existing ontologies in a modular way is important to avoid high investment costs. Efficient versioning on the other hand is essential to improve the first version of an adopted ontology continuously. In this regard, ontology evaluation is a part of the ontology selection and modularization process for creating the first version and on the other hand an important part of the continuously ontology improving process.